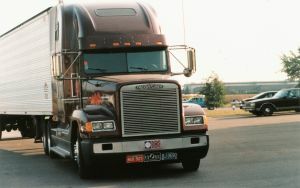 Fatigue and lack of sleep while driving an 18 wheel tractor-trailer rig can cause accidents and deaths on the highways. Under the existing rules that govern trucking companies, these companies can compel their drivers to drive up to 11 hours in a 21 hour time period. Drivers are allowed to drive up to 88 hours in an 8 day period. Whereas most people work a 40 hour week, current rules governing truck drivers allow them to cram more than 2 weeks of work (driving) in slightly over 1 week. This inevitably results in truck drivers driving for very long periods without adequate time off to rest. That, in turn, can lead to fatigue and other symptoms caused by sleep deprivation. 65% of truck drivers have reported feeling tired or drowsy while driving. Astonishingly, 48% of truck drivers have reported that they have fallen asleep while operating an 18 wheeler. The legal weight for an 18 wheeler is 80,000 (40 tons). By comparison, the average weight of an automobile is slightly over 5,000 pounds. One can imagine the devastation that can result when an 18 wheeler weighing 80,000 pounds and being driven by a sleepy driver collides with an automobile weighing 5,000 pounds. Recently, the Federal Motor Carrier Safety Administration has proposed changing the rules by reducing the number of hours that truck drivers are allowed by law to drive in 1 day, the so-called Hours of Service rules. The agency is recommending that maximum driving time be reduced from 11 hours to 10 hours a day. Other recommendations involve giving drivers a 1 hour break during each day by limiting their actual duty time from 14 to 13 hours. Drivers are already required to get 8 hours rest each day. Opponents of the proposed rule changes argue that the new rules will further complicate the trucking industry and add additional regulatory costs to an already overburdened U.S. Government. Proponents of the proposed rule changes argue that they will improve safety for all drivers on our highways. As Georgia truck accident lawyers who have represented injured victims of tractor-trailer/automobile collisions and their family members, we encourage Congress to do everything possible to stop trucking companies from forcing drivers to drive extremely long hours with few breaks. Instead, these companies should encourage drivers to obtain adequate rest and sleep so that their drivers will be alert and in control while operating tractor-trailer rigs on our highways. If you or someone you know has been injured in a trucking accident, contact the truck accident lawyers at Suthers & Thompson.